Items relating to the crisis surrounding US President Trump's announcement on Dec. 6, 2017, recognizing Jerusalem as Israel's capital and announcing the eventual transfer of the US embassy from Tel Aviv to Jerusalem. 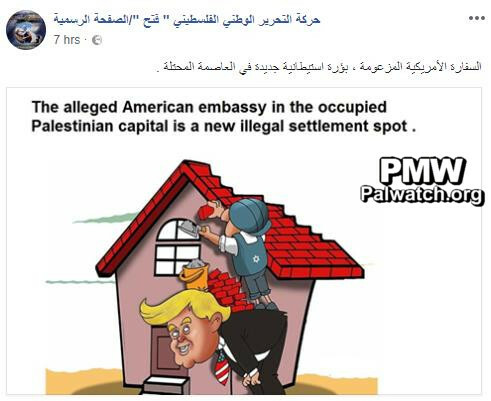 “The [Palestinian] Journalists’ Syndicate demanded to boycott the meeting to which ‘the American Settlement’ in Jerusalem (i.e., the US embassy) invited a few Palestinian journalists. On Dec. 17, 2017, PA TV started rebroadcasting the same song calling for terror, adding an intentionally blurred and indistinct version of Trump's speech recognizing Jerusalem as Israel's capital. This song aired 10 times on official PA TV on Dec. 17, 25 and 26, 2017 and on Jan. 2 - 17, 2018. Headline: "Abu Samhadana: The Palestinian leadership is waging a fierce battle against the tyrant of the century in order to thwart the deal of the century"
He also noted that the Trump administration will do all that it can in order to pass this deal of the century, even to the point of threatening the Palestinian leadership with political and physical assassination, and seeking an alternative [to the Palestinian leadership]." Headline: "The aggression and idiocy syndrome"
All of this has created a pattern of aggressive actions and decisions by President Trump, beginning with the decision to give Jerusalem to Israel as a gift with the stroke of a pen, [and] the transfer of his embassy as a settlement outpost to [Jerusalem] (Trump recognized Jerusalem as Israel’s capital on Dec. 6, 2017, and transferred the US embassy to Jerusalem on May 14, 2018; see note below –Ed.) so that it would fit the characteristics of real estate dealer [US Ambassador to Israel] David Friedman, who is reviving the character of 'Shylock’ (refers to an evil Jewish moneylender in a Shakespearean play who demands that a debtor repay him with a pound of his own flesh –Ed. 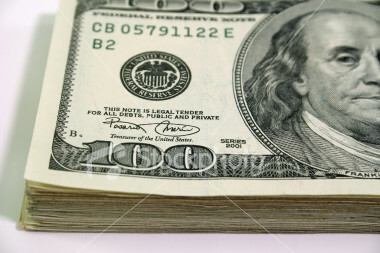 ), who was created by the greatest playwright in the English world, William Shakespeare." 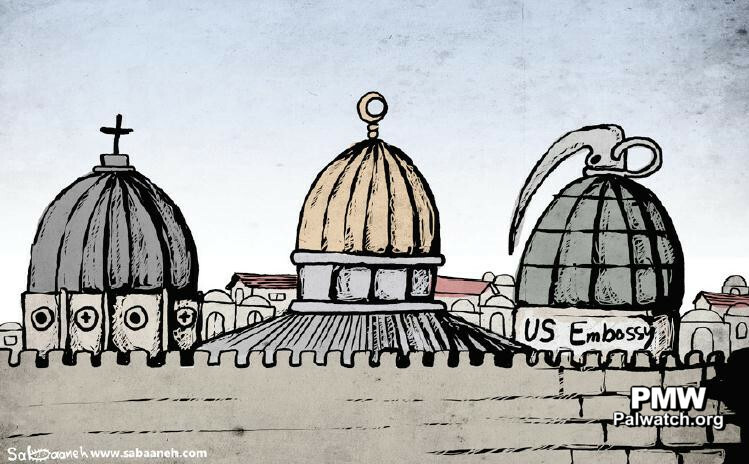 The US embassy opened in Jerusalem on May 14, 2018. “Qalqilya District Governor Rafe’ Rawajbeh led the regular meeting of the [Qalqilya District] Executive Council in his office yesterday [Sept. 10, 2018], in the presence of Deputy District Governor Husam Abu Hamda and members of the council. The image shows an elderly woman covering her mouth with her headscarf. Behind her many tents – apparently a refugee camp – can be seen. In front of the woman is a logo that includes an American flag crossed out with a red line. The two texts refer to US President Donald Trump’s Middle East peace plan, which has not been published yet and Trump’s recognition of Jerusalem as Israel’s capital. 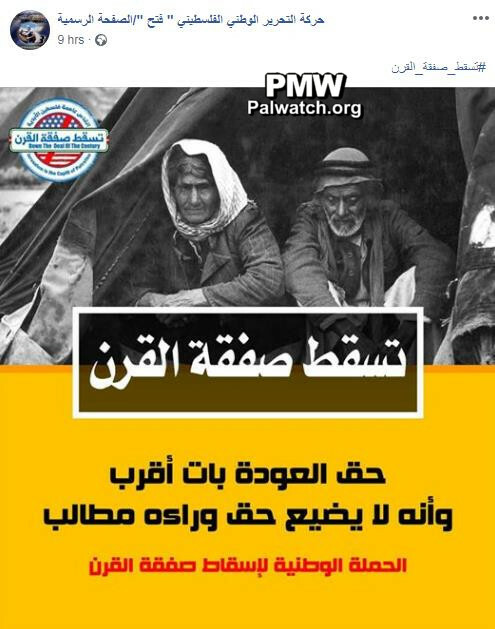 The image shows two elderly Arab men – apparently refugees – sitting in the entrance to a tent. At the top left is a logo that includes an American flag crossed out with a red line. 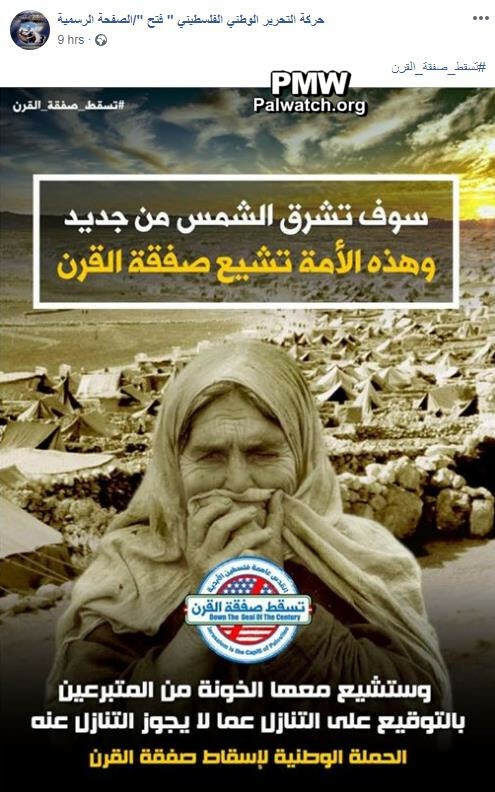 The image shows a group of Arab people – apparently refugees – walking next to a wall while carrying bags. At the bottom center is a logo that includes an American flag crossed out with a red line. The image shows US President Donald Trump’s Senior Advisor Jared Kushner with a large red “X” crossing out his face. 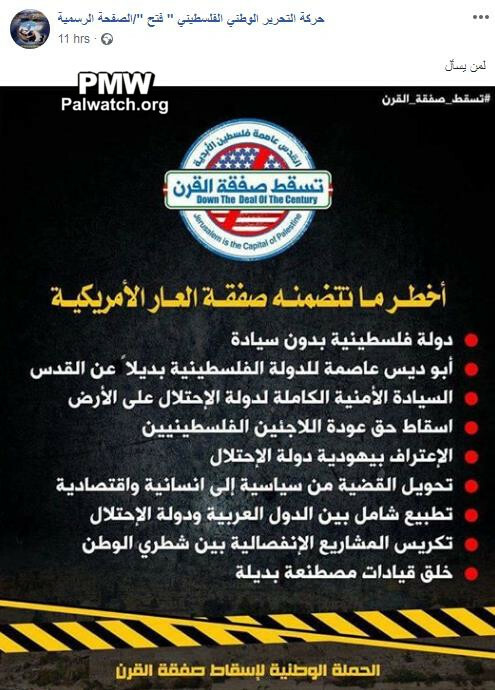 At the bottom right is a logo that includes an American flag crossed out with a red line. The image shows hazard tape at the bottom, and at the top is a logo that includes an American flag crossed out with a red line. The two texts refer to US President Donald Trump’s Middle East peace plan, which has not been published yet, and Trump’s recognition of Jerusalem as Israel’s capital. 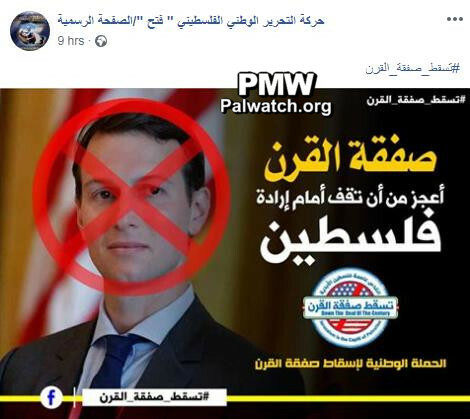 “Supreme Shari’ah Judge of Palestine and [PA] President [Mahmoud Abbas’] advisor on Religious and Islamic Affairs Mahmoud Al-Habbash called on the Arab and Islamic governments, organizations, and peoples to respond to US Ambassador to the occupation state [Israel] David Friedman’s disparaging of the Islamic faith. “[US President] Donald Trump, who issued the ominous Jerusalem declaration (i.e., recognition of Jerusalem as Israel’s capital) and talks about ‘the deal of the century’ (i.e., Trump’s as yet unrevealed Middle East peace plan), continues in his unparalleled stupidity to talk about peace. The image shows US President Donald Trump planting rows of houses with red roofs, characteristic of Israeli towns in the West Bank. Trump is holding a spade and has a watering can next to him, and next to it is a box with more houses in it. 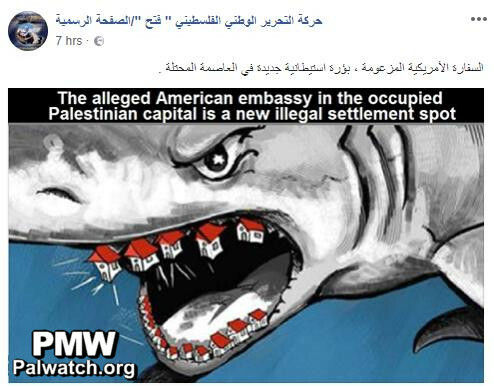 The image shows a shark with its mouth open, and instead of teeth it has rows of houses with red roofs, characteristic of Jewish towns in the West Bank. The sparkle in the shark’s eye is in the shape of a Star of David.